In late July, our planet.s northernmost land masses appear to finally be responding to the warmth of Northern Hemisphere summer. Ellesmere Island, Canada, (top left) and northern Greenland (right) have decided kick off their snowy winter garments in this true-color Moderate Resolution Imaging Spectroradiometer (MODIS) image from July 3, 200. Bare brown soils are exposed along the coasts of the still frozen (but thawing!) Arctic waters. Several large, permanent ice caps and glaciers will remain on Ellesmere Island year-round, and Greenland does little more than remove her mittens, but thinning, blue ice is showing up in the many fjords and inlets in the rocky coastlines, showing that temperatures are on the rise. The Nares Strait, which separates the two land masses, still has a way to go before a passage opens up between Baffin Bay to the south and the Artic Ocean to the north. Although Ellesmere Island appears to be "higher" or farther north than Greenland, that is simply a result of the way the high-latitude scene was projected into an image. To better picture the terrain, imagine that you took a printed copy of the rectangular image and rolled it into a cylinder along its northeast-southwest axis. 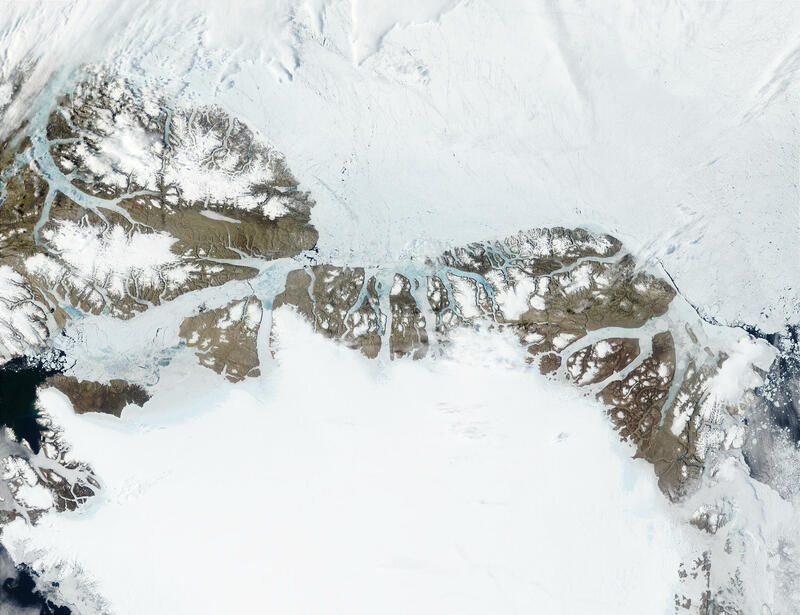 If you held that cylinder straight up in front of you, you would find that Peary Land, Greenland (right of center), is actually the more northern terrain. In fact Peary Land is the northernmost point on land on the Earth.